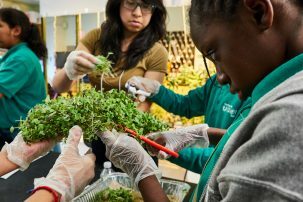 Students from Columbia University’s Sustainability Management program recently presented Teens for Food Justice, a nonprofit focused on equitable access to healthy food, with an ambitious report that includes a plan to enhance nearly every aspect of the organization’s operations. 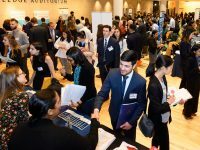 Over the previous months, they had spent hundreds if not thousands of hours researching, analyzing, and authoring the exhaustive document, aiming to convert their previous eleven courses into real-world service. Their project began when Susanne DesRoches, a Sustainability Management faculty member, approached SUMA ‘13 alum Henry Gordon-Smith with the idea. 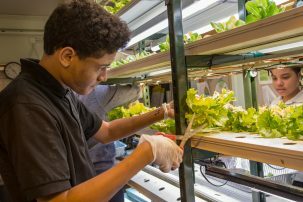 He was particularly focused on assuring that the organization, which works in Title 1 schools training youth to be urban farmers, would be able to most effectively work towards its mission and keep up with the pace of technological change in its industry. 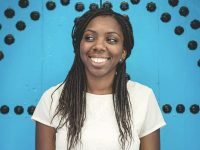 “They needed the insight that these students could deliver to make them scalable and to stay well-positioned for funding,” said Gordon-Smith. The students faced their own version of the problem: narrowing the scope of their research into several vast fields. “The trick to a good capstone project outcome is marrying research from academic literature with what’s happening in practice—and then to analyze all of that to find the best practices that are the right fit for the client,” said DesRoches, who led the project. Indeed, the report synthesizes a massive trove of information, from investigations of American hunger (“in 2015, 1.25 million New York City residents were food insecure”) to an array of recommendations for their client (“track information from seeding to distribution for each crop”). In the end, Gordon-Smith envisions far-reaching consequences of the report. “Our ultimate goal is to produce results for the at-risk population that the program works with,” he said. “The kids in the program will get the benefit of everything from better safety measures, to learning computer literacy, to an understanding of how to thrive as young professionals” said Gordon-Smith.